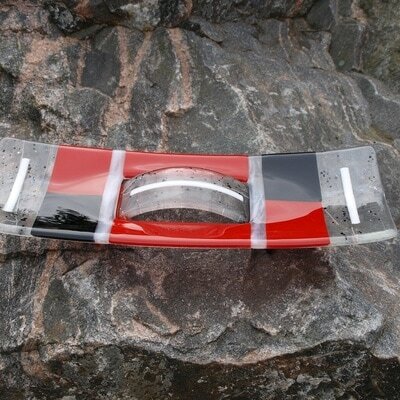 Hand crafted fused glass plates, bowls and pictures - Life's a Glass! I love working with glass, its addictive. I enjoy the peace in my workshop, in a colourful world with my own music on, cutter to the ready, lost in my world of glass. After my new pieces are cut and ready, I then go on to top up my stock for FOCUS, I just love it. I am a self taught fused glass fanatic. I love the thrill of opening my kiln and see the finished piece of work. Sometimes better than I anticipated, sometimes it's a re-do it piece. I have been taking glass workshops for a few years now, it's a very productive day but fun. I make a variety of glass bowls in various sizes, kitchen pieces, art pieces and now garden fun totem poles and mushrooms and flowers. My love of glass started when I took a stained glass course in Aboyne. I really enjoyed it so I began to look for tools on the internet. That led me to a site full of absolutely beautiful fused glass. I didn’t know anything about it, except I knew that I really wanted to make my own, so I researched further. 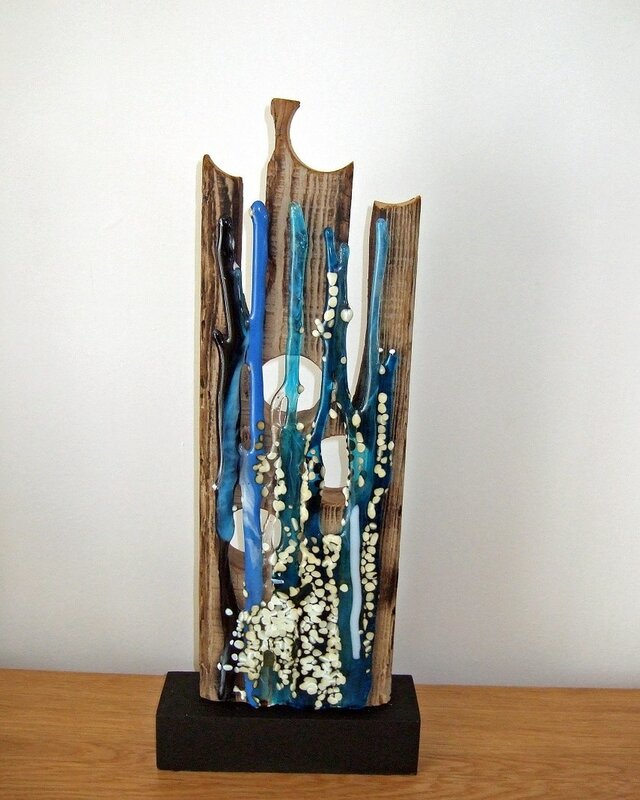 Pinterest was a great source of inspiration and I was mesmerised by what could be made. There was only one snag and it was a pretty major one. I needed a kiln and they are pretty expensive. Luckily, Santa, in the form of my dear husband, was very good to me that year! Initially there was a lot of trial and error while my pieces became more accomplished. After a while, I started to accumulate so many finished pieces, I had to think about where to sell my work so I joined FOCUS Crafters and people started to buy my pieces at crafts fairs throughout the North-east. Fusing glass is a fascinating process. There are so many colours available and so much is possible. It’s a craft that goes all the way back to ancient Egypt. Each piece is individually designed and made. Precision is important, everything needs to be assembled without the smallest gap in between pieces as the finished glass needs to be 6mm thick. This is made of two layers. There’s a clear glass layer, topped with the coloured glass design. Once I’m happy with the design, the work is put into my kiln. The heat causes the glass to flow and fuse together. The fusing and cooling process takes a full day and reaches temperatures of almost 800 ℃. It’s fair to say my electricity bill is pretty high! I’ve been inspired by many glass artists since I caught my fused glass bug. I love the work of Brenda Griffen, Amy Burhoe, Terri Stanley and so many others. Pinterest also being a magical source of knowledge and inspiration for all types of artists. I’ve always been involved in arts and crafts, from my work as a painter to owning Meg’s Attic, the crafts shop in Banchory for a number of years. Even though I’m a relative latecomer to fused glass, I’m thrilled that I’ve been invited to exhibit in prestigious venues like the Milton Gallery, Drum castle and Castle Fraser as well as the Coo Cathedral. I’m happy to accept commissions, and it’s possible to see my work at a variety of local events and venues throughout the year. These include Focus Craft Shows, the Aboyne Games, the Banchory Show, The Milton Gallery, American Wives Association, The Tree Tops Hotel Aberdeen, Exclusively Highland Events and Woodend Barn. I love that so much is possible with glass. At 72, I’m still discovering new methods and techniques. I’m currently exploring painting on glass and also working with Encaustic Wax techniques. I believe that having a creative outlet is very rewarding whether you’re eight or eighty. Anyone with any artistic flare can develop in their chosen field whether they are self-taught or not. It’s never to late to start.